with three sets of prayers and readings. Click on the links below to go to the prayers and readings for each of the liturgies. The Lord said to me: You are my Son. for our Savior has been born in the world. for behold, I proclaim to you good news of great joy that will be for all the people. On this holy night, gathering in darkness, a choir sings the songs of our faith. sings out the true meaning of this feast. the good news of this blessed evening. death and life, the grand and the small, are summed up tonight. Let us celebrate Christmas tonight with abandon. Let us be drawn into its wonder and joy. Christ Jesus emptied himself and took the form of a slave. He was tested like us in all things and did not sin. Now let us worship him and pray to him with deep faith. By the power of your birth, comfort those who are saved. - give your holy people the gift of renewal in every generation..
and comfort for the troubled heart. I feel with a deep joy, the breaking light of your presence. Welcome to this earth and into our lives in this new way. and to be with me here in this life - and you are. that awaits us in your glory. and my feet dance with abandon. You have come! Thank you! and his reign will be without end. 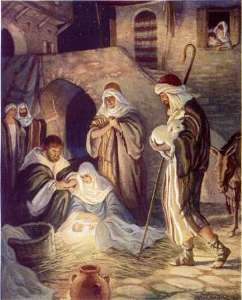 the story of the shepherds reminds us that the good news is for the poor. let us remember that the good news is address to what is poor in us. even when we are overwhelmed by fear, anxiety or any discouragement or disillusionment. hungering for justice and peace. We praise and worship him as we cry out in joy. and my soul bursts with joy. at your nearness to me, dear Lord. and I sense your presence in this jubilant light. but so willing to spread the joyful news. I just want to sing out, Lord. My voice is rising and my soul is opening up to you. Thank you for coming into my very poor life. I feel joy and hope and love. perhaps with a Christmas tree gift sharing with the children. Still, the choir draws us in immediately. the elderly and single friends around the community. We know why we are here, and it is easy to join in the singing. Let us give thanks today. Let us repeat the sounding joy of a faith-filled Christmas. Let's go forth to share glad tidings with our family and friends. beginning in our our hearts this day. This day feels so different already, dear Lord. You promised the glory of this day by the birth of Jesus. So humble, so simple, such a complete act of love. and help me to be faithful to your word. with a longing for your justice and peace. bringing life to the waiting world.